Nepal is progressing economically and democratically following the overthrow of monarchy and transformation into a republican state in 2008, according to the country’s top envoy to Korea. Nepalese Ambassador Arjun Jung Bahadur Singh said that the country has moved on to an era of “peace, stability and prosperity” after last year’s successful federal, provincial and local elections. “After our historic people’s movement of 2006 that overthrew the monarchy, Nepal became a federal republic in May 2008. 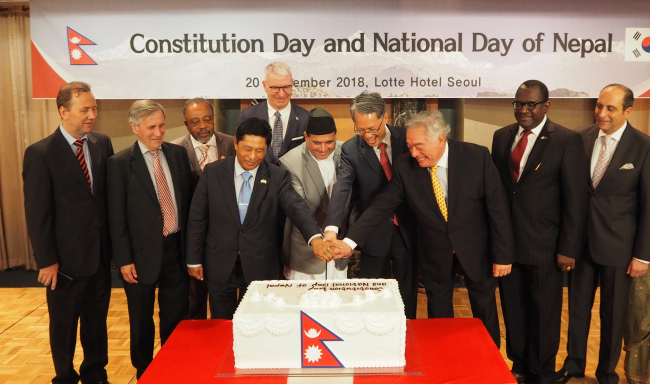 Our Constituent Assembly promulgated a new federal constitution on Sept. 20, 2015 -- our most democratic and inclusive supreme law that accommodates the aspirations of diverse ethnic groups and dreams of Nepali people to progress forward,” he said at Nepal’s National Day and Constitution Day on Sept. 20 at Lotte Hotel in Seoul, which was attended by former Nepali Foreign Minister Prakash Sharan Mahat. Nepal -- a landlocked South Asian country in the Himalayas -- was previously a Hindu kingdom. In 2006, the Nepalese people rose up against the direct and undemocratic rule of King Gyanendra in a democracy movement that eventually unseated him. The king agreed to relinquish sovereign power to the people, and on April 24, 2006, the dissolved House of Representatives was reinstated, which voted unanimously to curb the king’s authority and declared Nepal a secular state on May 18, 2006. On Dec. 28, 2007, a parliamentary bill was passed to amend the constitution’s Article 159, making the country a federal republic by abolishing the monarchy on May 28, 2008. Kathmandu and Seoul will celebrate the 45th anniversary of diplomatic ties next year. Korea has lent assistance to several national development projects in Nepal, and Nepal stands by Korea in its concerted efforts to secure a lasting peace on the Korean Peninsula, Singh said. On the economic front, Korea is one of Nepal’s top five foreign investors, according to the Nepalese Embassy. Korean investments have increased in industrial, hydropower, construction and service sectors, and more than 300 joint ventures have been created in electronics, textiles, chemicals and hotels. Bilateral trade has tripled over the last seven years. Over 35,000 Koreans visited Nepal last year, 37 percent on-year growth aided by four-time weekly direct flights between Kathmandu and Seoul via Korean Air. Nepal Airlines is working to open direct flights between the two countries next year. “As the land of Mount Everest and Lumbini -- the birthplace of Lord Buddha -- Nepal is a perfect destination for Korean tourists who love mountains, nature, culture and adventure,” said the envoy. Mount Everest straddles the border of Nepal and Tibet. Kang Jeong-sik, Korean deputy foreign minister for multilateral and global affairs, said this year’s Nepal National Day was “all the more significant” as federal, provincial and local elections were held for the first time under its new constitution. Touching on two-way commerce, Kang said the two economies have a complementary structure, which offers opportunities for strengthening trade and investment and development cooperation. As an example, the career diplomat pointed to the 216-megawatt Upper Trishuli-1 Hydroelectric Project and 30-megawatt Chameliya Hydropower Project in Nepal formed with Korean capital and technology.